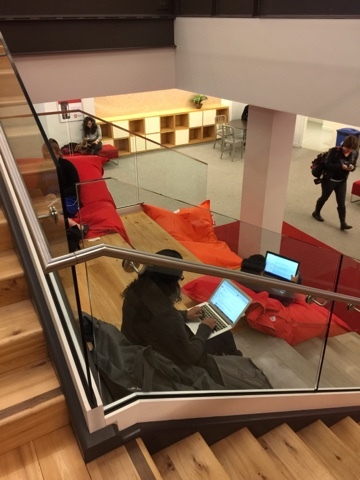 In this downtown startup work space design the designers used fat boy bean bags and an extra wide step tiered staircase to create work spaces where the employees can sit comfortably or even lie down for a nap. This design conserves a lot of space and is a great open space that's not too isolated. It can even be used for standup meetings. Thanks you for your posts. Have you ever thought about using any kind of vdr virtual data room for your business? I see that you are developing very fast and your business is constantly growing so this topic may be interesting for you. The designing of your bean bags are looking awesome, superb. bean beans suitable to children to play. For every one of the wonders technology has brought, one of its difficulties is the way it devours our time, here and there to the point of putting us out of equalization and crazy. It is a standout amongst the most presumed MUT scholastic organizations of the nation since the most recent forty years. Developing your Jennifer Lopez Anti Aging Products very own style is a great deal not the same as this and takes some creative energy and investigation of your preferences. I found your this post while searching for information about blog-related research . mayo international school patparganj.. It's a good post .. keep posting and updating information.